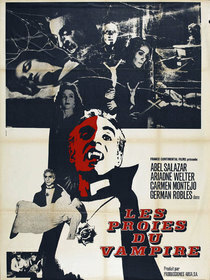 At the time of its release in 1957, Fernando Méndez’s El Vampiro was the first film about vampires that dared to show the creatures’ now-famous fanged incisors. This seemingly minor inclusion helped craft the modern vampire. Yet, time has certainly not done El Vampiro any favors, and while this film is a landmark in horror history, genre aficionados will remember the use of light and shadow in F.W. Murnau’s Nosferatu or the swagger and charm of Bela Lugosi’s Dracula before remembering the teeth shown here. There is an excellent plot unraveled in El Vampiro, complimented by an equally excellent score; however, it is is filled with (mostly) uninteresting characters, misguided pacing, and constricting camera movements. 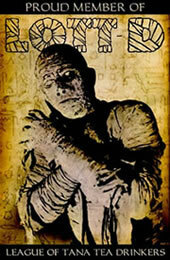 El Vampiro is not a bad film - it’s just not a particularly interesting one. El Vampiro follows a fairly complex plot, which is unraveled gradually and plays out like an old mystery novel. At a train station in Mexico, an oversized crate arrives, filled with soil from Hungary. Meanwhile, two strangers, Marta (Ariadna Welter) and Enrique (Abel Salazar), meet. Marta is looking for Sicomoros, the village from her childhood where her two aunts reside, and Enrique seems to be going whichever direction Marta is headed. Both strangers hitch a ride into town on a wagon that has come to the station to retrieve the mysterious crate and deliver it to its owner, Mr. Duval (Germán Robles). Marta and Enrique arrive in Sicomoros to discover that Marta’s aunt Maria Teresa (Alicia Montoya) has died during a state of mental delusion and her other aunt, Eloisa (Carmen Montejo), has taken control of the property and, eerily, does not appear to have aged. Eloisa is secretly conducting business meetings with Mr. Duval, who, it turns out, is her neighbor, and is looking to purchase Sicomoros in hopes of reviving his dead relative, Count Lavud. Interesting, "Lavud" backward is… oh, never mind. There is, however, a severe hindrance to this pacing: the introduction of monologues. Several characters in El Vampiro have extended speeches that summarize most of the important plot points, a technique that devalues the previous practice of gradual unveiling. It could be a result of a time constraint on screenwriter Ramón Obón’s script, which feels as though it could cover a two-hour block of film, instead of the mere 90 minutes it is crammed into. Much of what is said during these monologues is already known to the audience (Eloisa is under Duval’s mind control? Perish the thought!) or can be figured out without much investigation (“Duval” spells what backward? ), so not only is the information a burden on the pacing, it is unnecessary as well. It does not help the situation that some these characters are severely uninteresting to the audience, the result of lackluster dialogue. In particular, I had trouble discerning the on-screen chemistry between Salazar’s Enrique and Welter’s Marta. Most of their dialogue is, for lack of a better word, strange, and it makes their relationship uneven and uninteresting. Take, for example, a scene the two share where Enrique consoles a crying Marta by telling her crying "makes women more beautiful." That line seems innocent enough until it is followed with this one: "Make sure to lock your bedroom from the inside tonight because I’m a sleepwalker." This could be Enrique’s attempt of humor or he could just be that creepy, but, either way, Marta’s reaction is sterile; she seems neither consoled nor disgusted with Enrique, leaving the audience to wonder what they’re supposed to feel about these two characters and their interactions with one another. Méndez’s camera moves through these scenes blandly, choosing to shoot a majority of mid-shots during the scenes of dialogue. This becomes a bit repetitious as the movie progresses. The action scenes aren’t much better, since the director switches to close-ups, with little variation in his shots. El Vampiro feels like it was shot by a traditional Hollywood director, as if there were some sort of formula to the shots and their placement in the film. There is, however, one good use of close-up, and it is of Robles’ eyes as his Count Duval stares at Marta just before he flies to her window. It reminded me of some of the infamous close-ups of Bela Lugosi’s face in the original Dracula. This is, unfortunately, the only scene that is worth mentioning. One aspect of the film that does work is the soundtrack. As fans of Dracula are used to hearing, El Vampiro uses a lot of operatic pulses for its score. Considering the commanding demeanor that Count Duval takes in the film, these sounds - primarily violins, cellos, and various brass instruments - are well chosen. At times the score almost overtakes the action on screen, a fine reflection of Duval’s character in the film. If the plot of the film unveils itself like a novel, then the film’s score is implemented like a tragic opera. I have not spoken on the special effects used in the film because I understand the constrictions of the filmmaker and the time period, but I do have to speculate on the decision to have the vampires turn into bats during parts of the film. These are the least compelling effects in the entire movie; the wires that hold these rubber bats are clearly visible. I understand the limited resources, but I must ask the point of such effects when there are scenes in which these same vampires disappear and reappear in a new location. Instead of having the vampires turn into bats, why not have them transport to the bedside of their latest victim? There is much to admire about El Vampiro, and the film should be remembered for the bridges it built in bringing new myths to the vampire film. However, the film just cannot hold its own against its predecessors, and those looking for a crash course on the history of the vampire movie will find that films like Nosferatu and Dracula will provide better insight. It’s nice to see that El Vampiro can show us its teeth, but we need more than just a flashy smile.